A man who admitted racially abusing a US army veteran on a Manchester tram with two other males has been jailed. Juan Jasso was verbally attacked and had beer thrown at him for tackling the trio for using foul language on the Metrolink tram on 28 June. Jobless Robert Molloy, 20, of no fixed address, was jailed for six months for abusing Mr Jasso and two other men. Sentencing of Aaron Cauchi, 19, was adjourned over illness while a boy, 16, was given a six-month referral order. The court heard the trio had been drinking all night when they went on a "rampage" and abused Mr Jasso and two other people in separate incidents. Their abuse of Mr Jasso was filmed by a passenger and widely viewed. Trouble began at 07:45 BST when a passenger heard "disgusting, vile abuse" on the tram packed with mothers with babies, schoolchildren and commuters, the court heard. Joseph O'Connor, prosecuting, told the court the trio then got off the tram and surrounded another man, "with their chests stuck out and shoulders back, striking him with a cigarette lighter to intimidate him". Shortly afterwards another man was cycling to work when he passed the trio and one or more spat at him, the court heard. 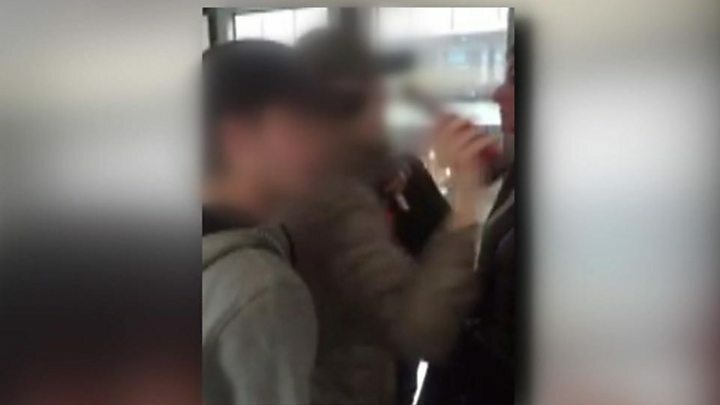 Molloy pleaded guilty to racially aggravated assault, common assault and using threatening words or behaviour. Jailing Molloy, chair of the bench Michael Evans told him: "Hopefully on your release from prison a lesson will be learned and you will be able to make a positive contribution and treat people with respect." Molloy was also banned from using Greater Manchester trams for two years. Cauchi, of Spa Crescent, Little Hulton, Salford, who admitted to using threatening words or behaviour to Mr Jasso and another man and an assault on a third man, was taken from the court in an ambulance to hospital after complaining of stomach pains. It is not known when he will be sentenced. The youth, who cannot be named for legal reasons, received a six-month referral on Monday. He was charged with using threatening words or behaviour and common assault.